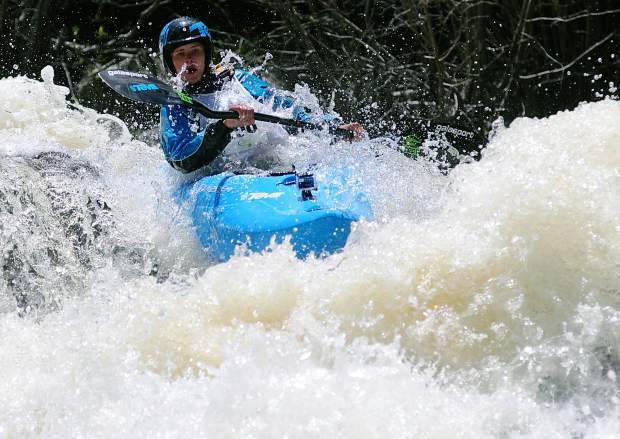 A kayaker barrels through Class IV+ whitewater during the Steep Creek Championship on Homestake Creek during the 2014 GoPro Mountain Games in Vail. GoPro Games is one of 13 river and whitewater festivals across the state this summer. Keen folks will notice there isn’t a single local event in the 2017 whitewater festival calendar. Why? There are plenty of reasons (freezing high-alpine water, anyone?) but the biggest one has to do with Summit County’s biggest body of water: Dillon Reservoir. Here’s a look at three can’t-miss events on our hometown lake this summer. River rats, your time has arrived. Beginning Memorial Day Weekend with the 2017 CKS Paddlefest in Buena Vista, Colorado’s short-but-sweet whitewater season begins in earnest after snow finally melts and flows on the Colorado, Arkansas, Yampa and other local rivers hit peak levels. That’s when kayakers, rafters, stand-up paddleboarders and duckie captains come out to play at festivals almost each and every weekend, leading up to the final big-time event of the summer at Gore Fest in the Gore Canyon just before Labor Day Weekend. Until then, there are plenty of ways to get your whitewater fix. Here’s a look at 12 of the biggest river festivals coming to Colorado this summer. Memorial Day Weekend might as well be the start of river season in Colorado, and there’s no better place to welcome summer than Buena Vista, home to the Arkansas River and everything it entails: the Numbers, Pine Creek, Brown’s Canyon and more. The 2017 event hosts SUP, kayak and raft races on Class II to Class IV rapids, along with flatwater clinics for kids, newbie paddlers and SUP yogis. Oh, and of course the requisite live music, beer garden, bouldering clinics, disc golf contests and more. Come for the pro kayak rodeo, stay for everything else, and especially contribute to one of several benefitting sponsors. Two words: retro rodeo. That’s all you need to know about Animas River Days, a two-day river festival on the San Juan River at Santa Rita Park in Durango. The retro rodeo — think a typical freestyle kayak rodeo using only old-school equipment — closes out long two days of kayak, canoe, raft, SUP and surf (yes, surfboard) races, all to benefit San Juan Clean Water Coalition and other Durango Whitewater partners. There’s also a pro freestyle kayak event, with prelims on June 2 and finals on June 3, plus a river parade right before the retro rodeo. Did we mention there’s a retro rodeo? Ever wonder what FIBArk might have been like back in the day, before festivals became the hot thing to do in the summer? Head north to Steamboat Springs and Charlie’s Hole on the Yampa River for the Yampa River Festival, a free-wheeling counterpart to the big, bold, business-like festivals on the Arkansas River. Things get started with a gear swap on June 2 at Backdoor Sports in Steamboat, and then kick into high gear on June 3 with racing: SUP, kayak and raft downriver, plus SUP cross, a raft rodeo and kayak “best trick” contest. There’s even a contest for the best river dog. How’s it work? Good question, but we’re betting it has to do with cute dogs doing cute things on the Yampa. Call it Lyons Outdoor Games, call it Burning Can Fest 2017 — whatever you call it, the welcome-to-summer festival hosted by Oskar Blues Brewery in Lyons is one of the coolest new festivals around. Held at Bohn Park on St. Vrain Creek in downtown Lyons, it’s a bite-sized version of major events like GoPro Mountain games, with mountain biking tours, trail runs, dirt jumping and BMX contests, a slalom kayak competition, dog jumping, yoga, disc golf and more, all with divisions for pro and open competitors. A ticket grants entry to the Outdoor Games, beer festival and live music, and proceeds benefits Oskar Blues’ CAN’d Aid Foundation. The GoPro Mountain Games is way more than rivers these days — there’s mountain biking, trail running, slacklining, dog dock-jumping, artist live-painting and free music playing, drawing 45,000 people — but paddling events on Vail’s hometown waterways are still a major draw. There’s the kayak rodeo in Vail Village on Gore Creek, followed by the rowdy 8-ball kayak (think bumper boats on rapids) and downriver SUP and kayak races. Then there’s the Steep Creek Championship, an invite-only kayak race on a quarter-mile stretch of Class IV+ rapids at Homestake Creek outside of tiny Red Cliff. Most events are open to amateurs and the public, so bring your boat. Teensy-tiny Dolores celebrates its 14th annual Dolores River Festival this summer on the banks of its namesake river and nearby McPhee Reservoir. Held in Joe Rowell Park, the one-day festival is more about the music than the river — the lineup includes Jerry Joseph and The Jackmormons, Gene Evaro Jr., The Yawpers and others — but who can say no to boating between acts? It’s also one of the most affordable music festivals of the summer, with nearby camping for $10-$20, including RV spots. Dubbed “America’s oldest and boldest whitewater festival,” FIBArk (stands for “first in boating on the Arkansas) is back for another four days of rowdiness on the Arkansas River. Held mostly in downtown Salida, FIBArk has grown and grown since 1949 to become one of the biggest river festivals in the nation, period. There are nearly a dozen different pro and amateur races, including kayak, raft, SUP and the fabled hooligan race. There are also mountain bike races, trail runs and free music, plus pancakes breakfasts. Some people might call it overblown, but you’ve got to see this Colorado institution at least once. Some river festivals are all about the party. Others, like the Gunnison River Festival, are more about the rivers. This annual get-together (aka less than 5,000 people) begins June 22 with the Summer Solstice Party and live music, followed by organized and free-form river races for kayaks, rafters and SUPers on the headwaters of the Gunnison and Taylor rivers. There’s also a beer garden all weekend, because it’s a must these days, and vendor tents in downtown Gunnison. The festival is sponsored by the Upper Gunnison River Water Conservancy District. The Royal Gorge Whitewater Festival at Centennial Park in Canon City packs more river into two days than most people can handle in two weeks, but river rats aren’t most people. Stop by the first day for free music from Keller Williams, plus raft racing for pros and amateurs at the downtown Whitewater Park. Return the second (and busiest) day for morning yoga at 7:30 a.m., river racing for 14 disciplines from 10 a.m. to 6:15 p.m., and live music by Paramount at 8:45 p.m. until festival closing time at 11:15 p.m. That’s nearly 17 hours of playing on the Arkansas River — rest up. After a decade, the 2017 Ridgway River Fest promises to be the biggest yet (or so the website claims) with float trips, racing and a food festival at Rollans Park on the shores of the Uncompahgre River. There’s a SUP race, whitewater rodeo, hardshell and inflatable races, and the always-popular “Junk of the Unc” race, featuring a half-mile float down Class II waters on homemade craft. In the past, brave folks have paddled wooden pallets, garbage barrels and inflatables attached to whatever they found in their garage. It gets rowdy. What, you think river festing is only for mountain towns? The fifth edition of Denver’s “premier urban river fest” returns to Confulence Park and Little Raven Street in downtown for a couple of races and plenty of vendor browsing along the South Platte River. More than 20,000 people showed up last year for SUP, kayak and raft tours on the river, along with a SUP and kayak race, slacklining, rock walls and live music. The schedule is about the same this year, with proceeds from beer and food sales benefitting The Greenway Foundation. The summer river festival season closes out with a bang when Gore Fest returns to the Class IV-V whitewater of the Gore Canyon, found outside of Rancho del Rio on the Colorado River. (Yes, it’s still running that high that late in the season.) The experts-only kayak race through Gore Canyon is still the highlight, but thanks to the addition of a whitewater park near Pumphouse Recreation Area, organizers last year added a freestyle kayak rodeo, SUP cross and a downriver race, plus a family-friendly float trip.